How to get there If you come from Italy via Passo di Predel/Predil (1156m) a tarmacced road soon takes off (1094m) up to a farm called Koca na Mangrtu. It is the highest paved road in Slovenia and is quite nice and very scenic. It is also somewhat steep (especially at one place lower down wher they have rebuilt the road without a serpentine probably in place there earlier (20% here shortly)). There is a circle road at the top which is unsurfaced and just about cyclable. At the highest point of the circle road (2037m) you can strike slightly left up the grassy side for around 75 m to reach this pass. (The photo is more straight up from this point – watch out so you do not go to far straight up here as it is free fall without barrier for at least 600 m straight down.) One could conceivable also visit the Mangartu pass near the Mangartu mountain (the highest one up here). 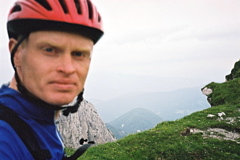 From Bovec (414m) in Slovenia this is an even harder and longer climb! Other comments There is no way you will be able to get down into Italy by using this pass – it is strictly only for people climbing passes on all four with ropes. Nice views all the way up, especially in the higher regions. There are a couple of unproblematic tunnels. There is a guard before the last tunnel (probably toll booth for cars).